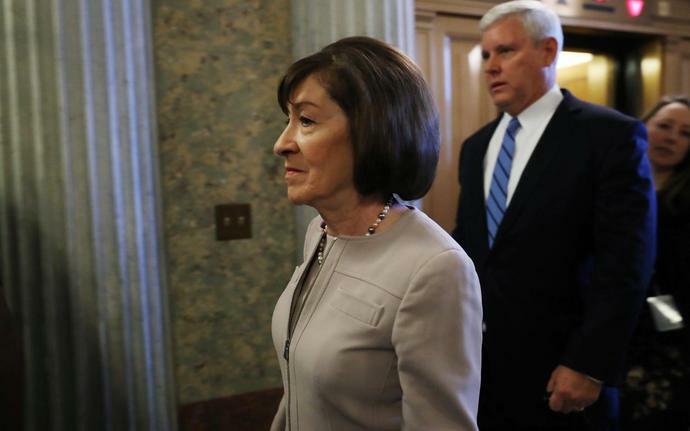 Businesses in Maine are facing a backlash after Susan Collins, the state's Republican senator, decided to back the nomination of Brett Kavanaugh to the Supreme Court. The Senate confirmed Mr Kavanaugh by 50 votes to 48 with Lisa Murkowski, another Republican, voting against his appointment but Joe Manchin, a Democrat from West Virginia, backing President Trump's nominee. "Dear Susan Collins - I really struggled with this but my tourist $ just voted against ever visiting Maine while you remain in office," he tweeted. He said he will look elsewhere in order to encourage Maine's fishermen to vote her out of office. "My intention was not to harm the Maine fishing industry, but to encourage people to take a stand for what they believe in, especially come election day, to remove people who supported Kavanaugh, and subscribe to his treatment of women,' he said. "Moving forward, I will educate myself on the source of the seafood we use in my restaurants and understand who is providing it and who they support politically, to make better decisions. Mark Murrell, who runs GetMaineLobster.com, is among the businesses which bore the brunt of those incensed by Ms Collins' vote. "We had customers who have contacted us saying they are boycotting us because of her speech and vote," said Mr Murrell. "Basically they want businesses like ours to hustle and vote her out. But she is not up for re-election until 2020. "But we have also had people from the other side who, after they read the story, contacted me and said they were going to order more." Mr Murrell said he had written to Senator Collins following her decision. "I was not happy with the course she took." The Telegraph approached Senator Collins' office, which declined to comment.